Definition at line 66 of file PostDominators.h. Definition at line 71 of file PostDominators.h. Definition at line 82 of file PostDominators.h. Definition at line 75 of file PostDominators.h. Definition at line 76 of file PostDominators.h. Definition at line 59 of file PostDominators.cpp. References DT, and llvm::DominatorTreeBase< NodeT, IsPostDom >::print(). Definition at line 86 of file PostDominators.h. References llvm::createPostDomTree(), llvm::DominatorTreeBase< NodeT, IsPostDom >::print(), and llvm::DominatorTreeBase< NodeT, IsPostDom >::releaseMemory(). Definition at line 47 of file PostDominators.cpp. 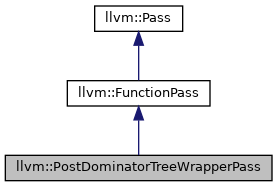 References DT, and llvm::DominatorTreeBase< NodeT, IsPostDom >::recalculate(). Definition at line 52 of file PostDominators.cpp. References assert(), llvm::DominatorTreeBase< NodeT, IsPostDom >::Basic, DT, ExpensiveChecksEnabled, llvm::DominatorTreeBase< NodeT, IsPostDom >::Full, llvm::DominatorTreeBase< NodeT, IsPostDom >::verify(), and llvm::VerifyDomInfo. Definition at line 69 of file PostDominators.h. Referenced by print(), runOnFunction(), and verifyAnalysis(). Definition at line 67 of file PostDominators.h.